Indian food is delicious. But expensive (unless you go to Panna II, which is a delight on so many levels) (and while we're on the subject, does anyone want to be a gentrifier and go to Jackson Heights with me?). 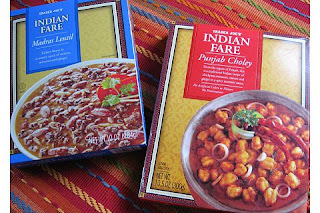 So Trader Joe's Indian food should be wonderful: they're usually great at "ethnic" food (see: tamales, pizzas, a lot of the boxed Asian noodle dishes), and you essentially get food that usually costs sixteen dollars for under five. But the tradeoff: it's not great. While I happily scarfed down their Palak Paneer after TJ's visits, impressed by the novelty and the spirit of making something so foreign and delicious, the consistency is awful and the tastes are off. On the other hand, the naan is good, especially if you oven it, but what sort of bread isn't good when you put it in the oven? While previously I'd been disappointed by the mushy pouches, today I had the worst TJ's microwavable Indian fare by far: half a microwavable meal of rice and "chicken" (I think maybe it was tofu? it was three or four small mushy cubes in a thin red sauce), and veggie samosas. It microwaved poorly and congealed into one big mush. Ugh. Save cheap Indian fare to cheap Indian restaurants; TJ's Indian, we're through.